Owning a restaurant is the dream of many who are passionate about food, enjoy serving it to others and want to run their own business. If you have decided to take the plunge and become a restaurateur, congratulations on making your dreams a reality. This business can be rewarding, but it is also one of the most challenging, with a high rate of failure for new ventures. A lot goes into operating a successful restaurant. One of the most important aspects you must tend to is designing a great concept that will resonate with your target market. Here are some tips to assist you in doing just that. This tip may seem a bit obvious, but many people do not get specific enough when determining the vision for their business, regardless of the industry. Give some deep, careful thought to the vision you have for your restaurant. What type of atmosphere are you hoping to create? What type of customers are you targeting? Consider your budget. Make sure you have the money to design the restaurant the way you want, and that the concept is in line with the price points. Your restaurant should be designed in a way that someone can tell right away, without even looking at the menu, what type of establishment it is. The clearer you are on your vision, the more successful you will be in bringing it to life, from your menu covers to your color scheme. Getting a restaurant up and running is challenging in many respects; like any business, you have to find a way to keep pace with your competition. Do not make it any harder by setting up a restaurant that is practically identical to established eateries in your area. Yes, there are a limited number of cuisines in this world, but it is possible to establish a unique brand. What can you do to make yourself stand out from the other Italian restaurants? In some cases, maybe it is a good idea to consider the possibility that it would be a better idea to focus on a different type of food, no matter how great your family recipes for lasagna or raviolis are. When you think of the word ‘’trend’’ you may associate it with ‘’fad’’, something that will eventually pass and go out of style. But, this is not always the case, especially when it comes to food. 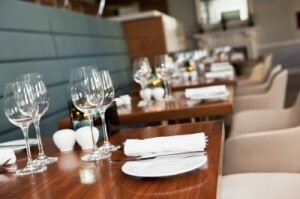 When considering your restaurant concept, think of what is on-trend at the moment. As people become more health-conscious, for example, fast food restaurants that offer healthful choices are growing in popularity. This is not the type of thing that will go out of style. The location of your restaurant and the general demographic of the area is an important point to consider. You should not design a restaurant concept that most people in the area could not afford, or would have little interest in experiencing. An upscale steakhouse smack in the middle of a college student neighborhood would probably not flourish. Consider profitability of your concept; some things may look great on paper, but the reality would be much different. Items that took too long to cook or too much labor would eat into profits. Owning a restaurant is really hard work, and requires you to give a lot of yourself. It is important to design a concept that you feel passionately about, something you feel committed to carrying out and nurturing. It should be the type of place you would want to eat at. Kelli Cooper is a freelance writer who enjoys blogging about all things business; she recommends visiting www.menushoppe.com for a selection of menus for your restaurant.